Smartphones are all the rage, but for those that are still in need of a feature phone in a flip form factor, Samsung and AT&T are gearing up to launch the Rugby 4 on October 10th. 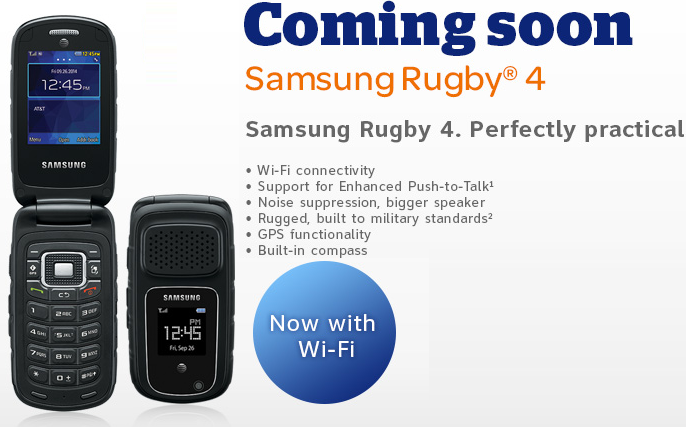 Like its predecessor, the Samsung Rugby 4 is a rugged push-to-talk phone. It’s the first in the series to offer Wi-Fi connectivity, and will be sold for $269.99 off-contract, $99.99 with a two-year agreement. But if you are one of business customer who choose an AT&T Enhanced Push-to-Talk rate plan then you only need $.99 to won this handset. The Rugby 4 is dust- and water-resistant (IP67), while also meeting the MIL-STD-810G standard for shock, vibration, temperature, low pressure, high-altitude, and other environmental conditions. AT&T didn’t reveal all the features of the Rugby 4, but we know that the phone comes with an enhanced speakerphone, built-in compass, and turn by turn navigation (requires subscription to AT&T Navigator). If you are still interested to buy this Facebook free device then you can see the Samsung Rugby 4 in action by seeing this video. The making of the video is also very odd, looks like its for 80s!